Errors in the Errors Dashboard and Logs in the Logs Dashboards by default are retained for 30 days before they are deleted. We also offer plans for 60 day or 90 day retention. To update to longer retention plan, navigate to the Settings>Billings page and click on "Update Service Plan"
Once a log message reaches an age of older than the number of days in your retention plan, the message is purged and will no longer be shown in the Stackify dashboards. Note: Choosing different retention plans is only available on the new pricing model. 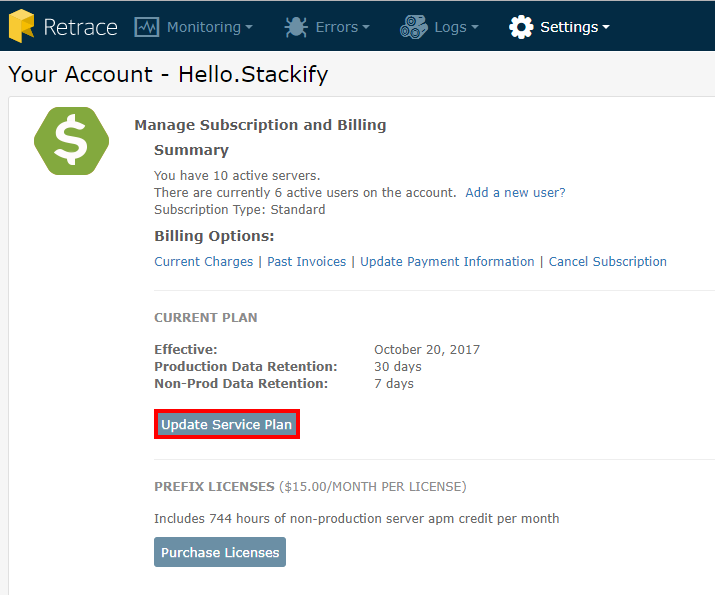 If the "Update Service Plan" button is not present on your account's billing page, please contact [email protected] for more information.